We all knew we were going to have to deal with Alexandria Ocasio-Cortez’s nonsense. Anyone who won that primary against incumbent and soon-to-be-former Congressman Joe Crowley was going to win. The district is more left wing than Lenin. It’s easy to poke fun of Ocasio-Cortez, who found herself in the spotlight thanks to that upset win. 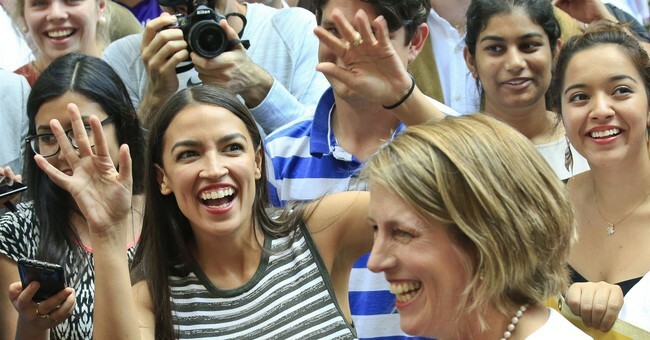 She’s a democratic socialist, with many of her colleagues viewing her as the future of the party. And by future, do they mean being the permanent minority party on the Hill? Only kidding. I hate those terms like permanent political majority (or minority). Public opinion can shock us—Hillary Clinton know this all too well. Still, we have some folks on the Right who are trashing her for her every word. Yes, it’s easy, but comments about her attire during orientation prior to Thanksgiving were atrocious. It’s cheap. It’s not effective. It makes her a sympathetic figure. It was overreach. Just let her talk. Often times, these left wing stalwarts hang themselves with their own words. Cortez thought that the three branches of governmentwere…the presidency, the House, and the Senate. It listed the four action items for the incoming far left House members, which include free college, a green new deal, and health care for all. Oh, and they want to abolish ICE. Most Democrats for obvious reasons are not pushing the latter heavily: it could swing suburban voters to the GOP again, as they’re concerned about security and gang-related violence. Free college and health care for all is just unrealistic, which is compounded by the fact that no one has a clue for how to pay for it; Ocasio-Cortez is once again the leader of the pack in that exercise. She thinks you “just pay for it.” Yeah, so do millions of American families who will see their employer-based plans, which they like very much, be cannibalized to export this slice of Venezuelan economic here. The new green deal will be straight trash just like the rest of Democratic politics. It’s most certainly going to be more left wing than Obama’s Clean Power Plan, which torched rural communities dependent of coal mining for their local economies. Her Twitter feed is an avalanche of stupid. Keep it that way; let her talk because she will soon find out that she’s a small fish in a big pond. She’s one vote. She can’t sign bills into law, and most of her agenda will die a legislative death when it reaches…the Republican Senate. I’m fine being called a bull in a china shop, because politics that answers to special interests more than the American people *should* be disrupted. Also, the idea that the same folks who bow to Trump are clutching their pearls is laughable. THIS is why we drag Alexandria, folks. It’s not her clothes or her style or even how ridiculous her tweets can be (and TRUST US, they are ridiculous), but it’s the idea that anyone is afraid of her or that she’s somehow more powerful than she is. We’d just like her to know what the heck she’s talking about before pretending she’s an expert. And maybe she should take a look at her thread because it’s not ‘Trump supporters’ who are actually clutching any pearls, it’s Democrats who are concerned she will destroy their party with her divisive blathering.